Shandong Qinghua Bean Sprouts Machinery Co., Ltd.
Qingdao Hezhou Agricultural And Stock Farming Machinery Co., Ltd. There is no need to hire someone to take care of the bean sprouts. And our price will lower than the trade company because we are manufacture. We need 7 days to prepare all the stuff then 30 days for manufacturing. 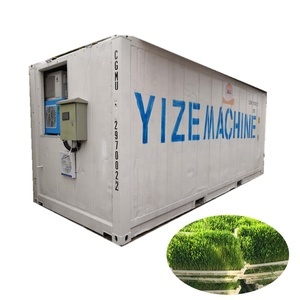 Top selling hydroponic fodder machine for sale Y-200 product show What's the Top selling hydroponic fodder machine for sale high quanlity Y-200 9 Top selling hydroponic fodder machine for sale high quanlity Y-200 is mainly used for growing fresh green grass from seeds. 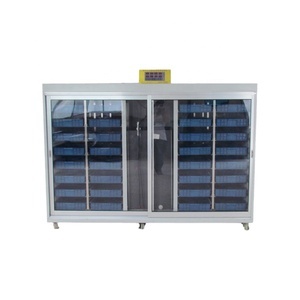 Automatic water spray, water spray interval display, drench water delay, manual spray water. contact me Any questions on Top selling hydroponic fodder machine for sale high quanlity Y-200 feel free contact with me ! 1 800 TZ-500 220V 4.5 351 500 0.3 Day(m&sup3;) 6 Day(KWH) 6 . 05*2 . 43*2 . 6 3000 TZ-1000 220V 6 702 1000 0.5 Day(m&sup3;) 10 Day(KWH) 12 . 2*2 . 44*2 . 6 5000 TZ-1500 220V 8 1053 1500 0.8 Day(m&sup3;) 12 Day(KWH) 12 . 2*2 . 5*2 . The machine realizes in the production process entire automation. So the rotten sprout, bacterial tinea, and vicious cycle rotten sprout will be controlled effectively . 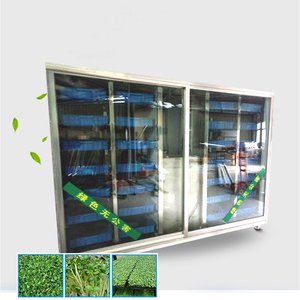 Machine can produce natural, fresh, no pollution grass. Poultry Feed Green Fodder Sprouting Machine System Container Type Hydroponic Growing Machine with large Capacity/ Hybroponic Seeds Sprouting Machine Brief introduction of Poultry Feed Green Fodder Sprouting Machine System Poultry Feed Green Fodder Sprouting Machine System refers to the fodder grown in a controlled environment using water but no soil is involved. it uses automatic temperature control and automatic watering system. People only need to put the seed into the plastic tray , it can automatic produce sprouts. Feature Features of hydroponic fodder machine 1. 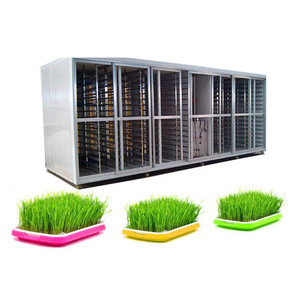 The framework of this hydroponic fodder machine is made of stainless steel. The ability to digest protein and starch is higher comparing to seeds and common grass. 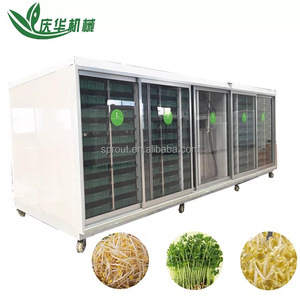 Features of hydroponic fodder system Stainless steel frame structure, enclosure for thermal insulation, waterproof, anti-rust. It can be used to grow green fodder within the whole year around, whatever the weather is. Therefore, it can control rotten sprouts, cooked bud, bacterial tinea, and vicious cycle sprouts. 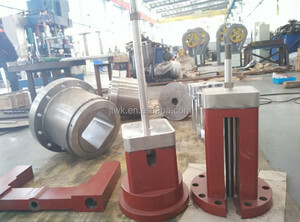 Product show Machine inner structure Final product Machine delivery If any interest in our machine, pls contact me freely. Qingzhou Disheng Automation Equipment Co., Ltd. 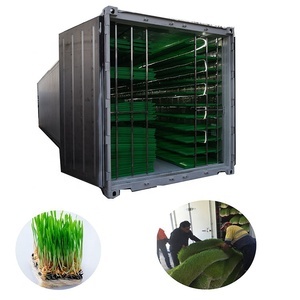 This 100kg barley grass growing machine can get used to make soybean, broad bean, black bean, mung bean, etc. The size of the bean sprout is adjustable according to your needs. 3. The size of the bean sprout is adjustable according to your needs. The pellets made mainly by small breeding can preserve at least half one year. The compressed feed pellet is healthier for poultry and livestock, such as chicken, duck, fish, pig, horse, cattle, sheep, etc. So basic to the moisture content of grain feed granulating before the moisture of the materials, more conducive to storage. 3). Alibaba.com offers 8,760 hydroponic fodder machine products. About 32% of these are feed processing machines, 21% are bean product processing machinery, and 2% are other greenhouses. A wide variety of hydroponic fodder machine options are available to you, such as free samples, paid samples. There are 8,676 hydroponic fodder machine suppliers, mainly located in Asia. The top supplying countries are China (Mainland), Turkey, and India, which supply 99%, 1%, and 1% of hydroponic fodder machine respectively. Hydroponic fodder machine products are most popular in Africa, Mid East, and South America. You can ensure product safety by selecting from certified suppliers, including 2,201 with Other, 995 with ISO9001, and 1 with ISO14001 certification.